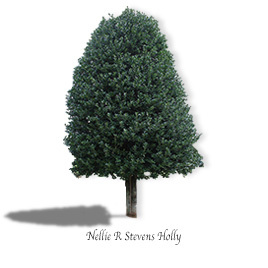 A cross between an English Holly and a Chinese Holly, the Nellie R Stevens is a great choice for hedge screens or alone as an accent. The leaves are glossy with a dark green color. Nellies produce inconspicuous white flowers in the spring and dark red berries later into late summer and fall. Cold and drought hardy. Average Landscape size: 10-12 ft x 6-7 ft.